These countries are so different, on the socioeconomic level: is there room for dialogue and understanding? There is no doubt that it is challenging to work together as a Jesuit Conference, but it is true that we share a lot. First of all, the richer countries can support the poorer ones. But the countries where there is real poverty can also contribute, for instance in the way faith is lived. To the exceptions of East Timor and the Philippines, the Catholic populations of the Asia-Pacific area are very small. But, the Catholic faith is especially strong. The Catholics are profoundly Catholic and they can enrich the spiritual experience of all of us. 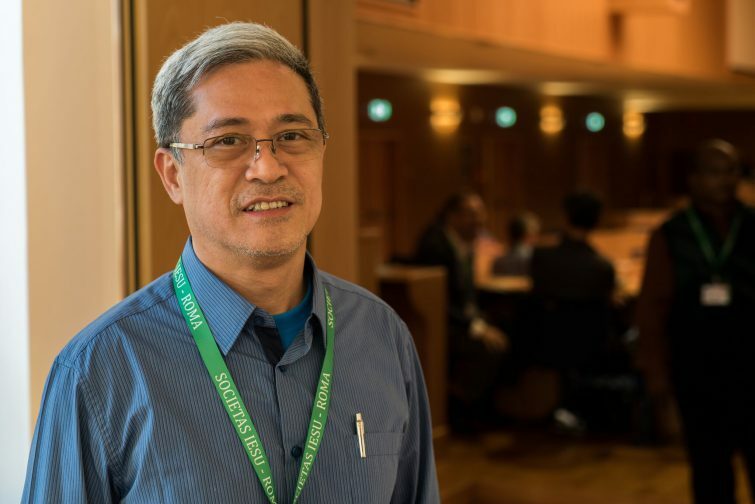 We, in the Philippines, we will soon celebrate 500 years of Christianity: we can share our experience of involvement in Jesuit education, in pastoral accompaniment, spirituality, social justice, communications and many other ministries. We can help the Jesuit works and teams in countries where there is only a minority of Catholics. What is expected from the General Congregation in your area of the world?. My fellow Jesuits and our lay colleagues and partners in mission have a lot of expectations in three ways. They look to what will come out of our gathering to identify what could be changed in our mission and ministries. There is so much to be done; but what directions could come from us, at the GC, to help us all be more faithful to our mission and more effective in our work. They expect to hear the response of the Society of Jesus to crucial global issues on the universal level, because we are a universal organization. We face religious violence, migration of people, secular culture, poverty, climate change. How can we harness the strength the Society of Jesus has as a global organization; how can we help each other to respond coherently to these global issues? They look forward to know the new leader, the new Superior General, to hear about his priorities and how he can inspire us. They wish he will continue in the line of Pope Francis and be a source of strong inspiration for us all. What has touched you the most, personally, since the beginning of the Congregation? The first week here has been a spiritual experience for me. It is difficult to unite close to 250 Jesuits. But I see, I feel and I experience the secret of the Society of Jesus. We might have an influence in many parts of the world through our intellectual life, our involvements in different fields, but what underlies that influence is what I am seeing here. We can be united in trust and faith; we can be led by the Spirit, and led together as a body. This is happening through individual and common prayer.